Entice Presents DJ Luck & MC Neat / Mark Radford ??? Save Event: Entice Presents DJ Luck & MC Neat / Mark Radford ??? Share Entice Presents DJ Luck & MC Neat / Mark Radford ??? ?? 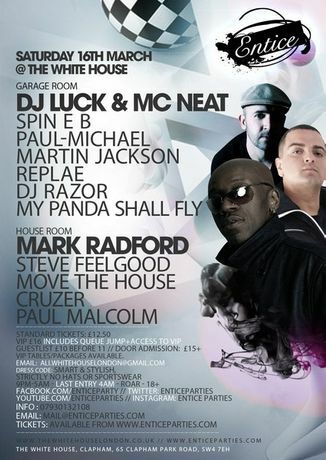 ?Entice Presents DJ Luck & MC Neat / Mark Radford ??? Entice proudly present the chart topping duo DJ LUCK & MC NEAT plus Rinse FM?s MARK RADFORD live @ The White House on Saturday 16th March.